Working with Silverlight, by Gavin Wignall. By splitting your project plan into 4 areas and seperating them with clear mile stones we can minimize over servicing. Each mile stone is recognized by the client signing off the progress so far and acknowledging the progression into the next stage. This progression means that returning to a previous stage can clearly be recognised as being out of scope and duely effect budget and dead line targets. The first 2 stages are all about defining scope where the creative limits of the project are cooked and set. The second 2 stages are about delivering the project. Discovery is about making sure the clients requirements are understood, costs are set out and the ground work is laid out for a solution to build on. Once Discovery is signed off Concept can be started with a clear direction. Concept is about creating and locking down the design and functionality. Once Concept is signed off the project can be built knowing that every element has been thought through, designed and laid out in a ‘Func spec’ – a document listing every element and every posible function. At this point the project is completely scoped out. Development can now proceed with a very clear path laid out to follow. Scope should not grow anymore unless it is treated as an additional request to the project. Once development is finished a test process is put in place to check quality and user experience. A refinement process is then carried out to tweak the experience based on the test feedback before getting client feedback and repeating. 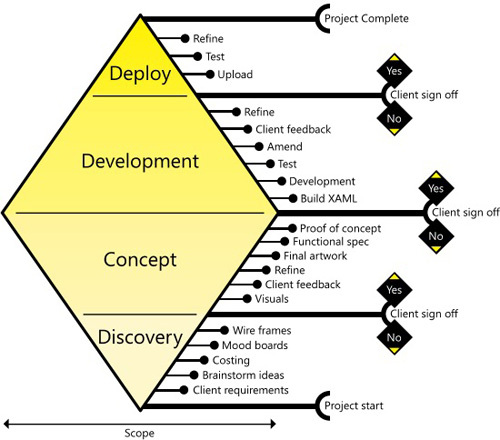 Once development is signed off the project is good to go live and requires to go through the Deployment process. Deploy involves uploading the experience to a live secret location or on a secure live area. This allows a final test before letting the experience go live. At this point the project is complete, hopefully on time and within budget. Finally, it is advised to set out dates to achive each mile stone. If a mile stone is hit too late it can be treated as an early warning that the project timeline is in danger of slipping. Either additional resource can be thrown in to get the project back on track, features can be taken out or the remaining mile stones and final goal post can be adjusted accordingly. At the very least it gives you a chance to manage client expectations early on in the projects life time. It is similar to other software projects. But good idea to split it in separate parts.